Shoulders long-unaccustomed to fast-bowling were put through their paces at the inaugural cricket match between Hawksmoor Investment Management and Ashfords Solicitors. The good-natured match, which took place at the picturesque ground of Heathcoat Cricket Club in the grounds of Knightshayes National Trust property, was arranged between Greg Sellers of Hawksmoor’s Taunton office and Stephen Walker from the Taunton office of Ashfords Solicitors. 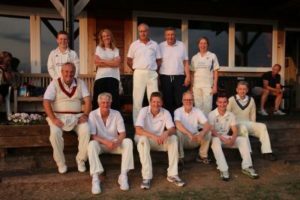 The Ashfords team included some excellent players from their network of offices across the South West, and the Hawksmoor team consisted of a combination of former sporting heroes, some plucky volunteers and a very talented ‘ringer’ in the shape of 14-year-old James Rew. All players enjoyed the chance to socialise over a very tasty barbecue as the sun set on a beautiful evening.